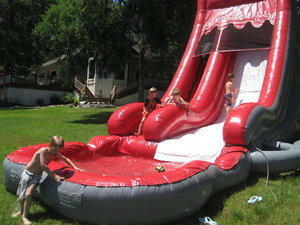 This 15ft tall water slide is huge, fast, and so much fun for the kids AND adults. The Volcano water slide has a large pool at the bottom. Another great feature is you do not have to exit the pool to climb the ladder again! You will not be disappointed with the Volcano water slide and it will provide hours of fun.